Alta Bikeshare, Fairfax County DOT, and FABB hosted a tour of the Capital Bikeshare system today for Fairfax County officials, staff, and interested parties. Around 20 people attended including Metro Board Chair Supervisor Hudgins, Andy Clarke and Bill Nesper of the League of American Bicyclists, Eric Gilliland, Capital Bikeshare general manager, Paul DiMaio, program manager of Arlington County’s bikeshare system, Charlie Denney of Alta Planning, representatives from the developer community, Transportation Advisory Commission, and county staff. 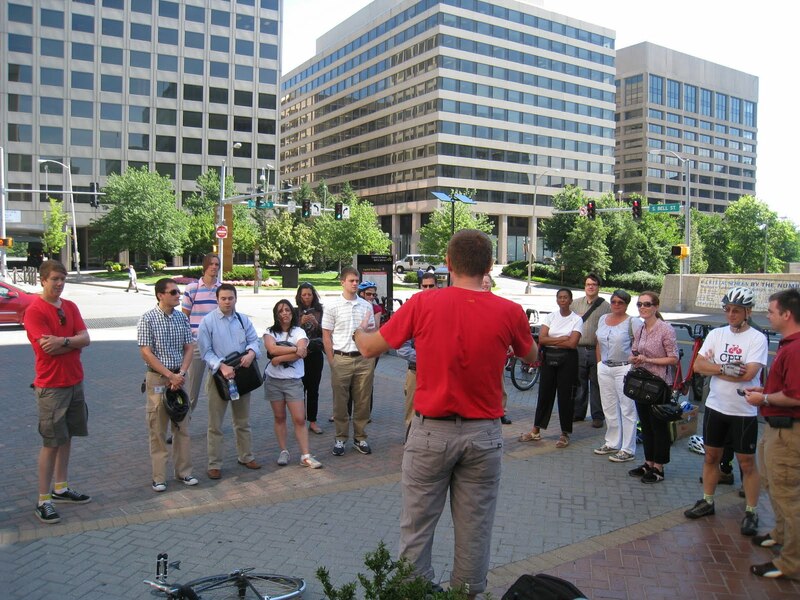 The group met at the bikeshare station at 18th and Bell Streets, adjacent to the Crystal City Metro Station. After a discussion of the system we visited a few stations and finished at the Pentagon City station. There are currently 14 stations in Crystal City stretching from the Pentagon City Metro Station in the north to Four Mill Run in the south. Arlington plans to add 30 stations in the Rosslyn, Courthouse, Clarendon, Virginia Square and Ballston areas. See the Capital Bikeshare website for details about the system. There is great potential for bikesharing in the more dense, mixed use parts of Fairfax such as Reston/Herndon, Vienna, the future Tysons area, Springfield, and inside the beltway. A key piece of FABB advocacy for many years has been for the County to prepare a master plan for bicycling over the next decade in our area. This plan would build on existing information and create a coordinated long-term strategy for the County for developing bicycling facilities and other components of a bicycling culture. 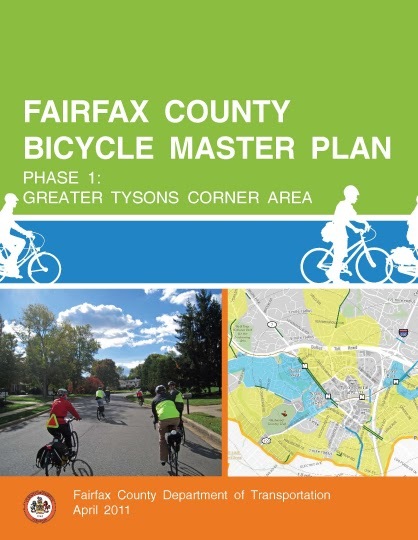 We are very pleased to report that the kickoff meeting for the second phase of the county bicycle master plan, which will encompass the entire county minus the greater Tysons area, was held on June 28. Fairfax County has contracted with Cambridge Systematics/Toole Design Group to create the plan. The bicycle master plan advisory committee (BAC) is comprised of representatives from the Board of Supervisors, the Trails and Sidewalks Committee, the Transportation Advisory Commission, MORE, VDOT, and county staff and includes FABB representation also. Five BAC meetings are planned during the yearlong process. The plan team have divided the county into 8 planning areas. Public workshops will be held in each planning area. Two countywide public meetings will be held and there will likely be 5 formal public hearings before adoption of the final plan. A final draft is anticipated in March 2012. A project website will be online soon with all pertinent documents, meeting dates, etc. There will be many opportunities for everyone to participate in the process and we greatly encourage you to provide input. Stay tuned as we will provide alerts and guidance as the project proceeds. See the county bike plan page for info about the Tysons plan. According to Dr. Gridlock, the new trail on the ramp that connects northbound Telegraph Road with Eisenhower Avenue is now open. 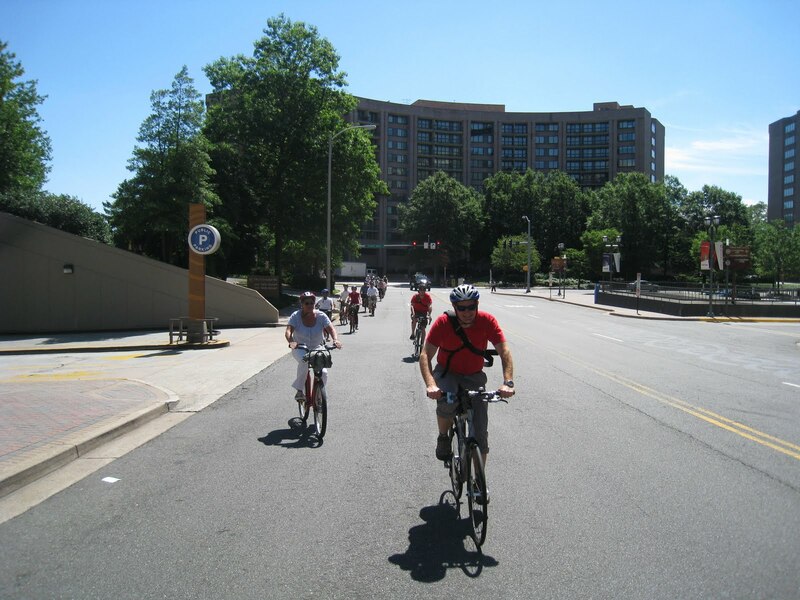 It opens access to the Eisenhower Valley for bikers and walkers who live south of the Beltway. The path is the first such direct connection between Huntington and Eisenhower avenues in the Telegraph Road area since the Beltway was built. The path crosses Cameron Run on the east side of the newly completed Telegraph Road bridge, then connects to the flyover ramp crossing the Beltway. A New York bicycle advocacy group, Transportation Alternatives, has started a campaign for mutual respect by all road users. They realize that many road users, including bicyclists, flagrantly abuse the rules of the road. As a bicycle advocacy group they are asking their supporters to take a pledge to Declare yourself a New Yorker for Bicycling. Responsible riding is safer for everyone. Bike lanes keep everyone out of each other's way and out of harm's way. A robust public bike share program empowers New Yorkers with more transit choices. I support these principles because more New Yorkers riding bicycles on NYC streets benefits New York as a whole. Bike-friendly enhancements to our streets improve New Yorkers' health, increase pedestrian safety and bolster a more vibrant business community. As a bicyclist, I vow to ride safely and create a positive street environment. As a pedestrian, transit rider or driver, I support the right to safe travel for New Yorkers who choose bicycling and recognize that we're all better off when everyone has safe space to travel. In the interest of a greener, greater New York, I call on my elected and appointed officials to do the same. After a year and a half, VDOT has finally filled the state bicycle coordinator position. We've heard that John Bolecek, formerly of the US Department of Transportation, is the new coordinator. While at USDOT John represented the U.S. DOT on Michelle Obamas' Let's Move childhood obesity taskforce. He's a University of Virginia graduate who is the author of Local Planning and Promotion of Bicycle and Pedestrian Accommodations: A Review and Analysis of Virginia Government Efforts. This paper examines steps that the commonwealth and selected Virginia localities have taken to plan for bicycle and pedestrian transportation. To the extent feasible, it also analyzes the costs and benefits involved. Thus it can serve as a guide for Virginia localities that may be considering similar programs. Ideally, it will also foster increased communication among local and state officials about the benefits of bicycling and walking, as well as best practices. This paper was written by John Bolecek, a recent graduate of the University of Virginia's Department of Urban and Environmental Planning. He works for the U.S. Department of Transportation as a transportation safety analyst and is a certified instructor for the National Safe Routes to Schools course. John wrote this report to fulfill the terms of the Wallerstein Scholarship, which he was awarded in 2008. The annual scholarship is awarded jointly by the Weldon Cooper Center for Public Service at the University of Virginia and the Virginia Municipal League. We're excited that John will be working to make Virginia a more bicycle-friendly place, and that the Draft State Bicycling Policy Plan and the State Bicycle Advisory Committee will be revived. 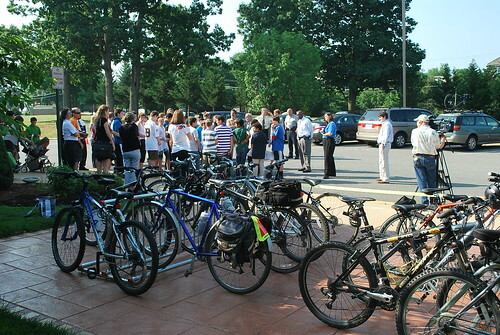 From Loudoun Co supervisor Andrea McGimsey: "This summer, Loudoun County will be holding several important community input sessions for the proposed bike and pedestrian improvements, both countywide and around the future metro stations. These public input sessions are a great opportunity to provide us with your feedback on critical community improvements, and I encourage you attend as many of the planned sessions as possible. RSVPs are appreciated. Please contact the Loudoun County Office of Transportation Services at (703) 737-8624 or by e-mail at ots@loudoun.gov. I encourage you to come out to listen and share your thoughts on these important county developments. If you cannot attend the sessions, please send your feedback to the Board of Supervisors at bos@loudoun.gov and to me at Andrea.McGimsey@loudoun.gov." On our way to a workout class this morning we happened across this police cruiser and motorcycle completely blocking the trail along Wiehle Ave at Sunset Hills Rd in Reston. The traffic signal was out and the police were directing traffic. When one of the officers approached the car we asked if it would be possible to park somewhere other than in the center of the trail. If you're familiar with this location, there's a large parking lot adjacent to the trail, to the right of the car. There's also a grassy strip to the right where he could have parked to leave part of the trail passable. His answer was "No!" There's no excuse for this behavior. It's disrespectful and inconsiderate of pedestrians and cyclists and anyone else wanting to use that trail. 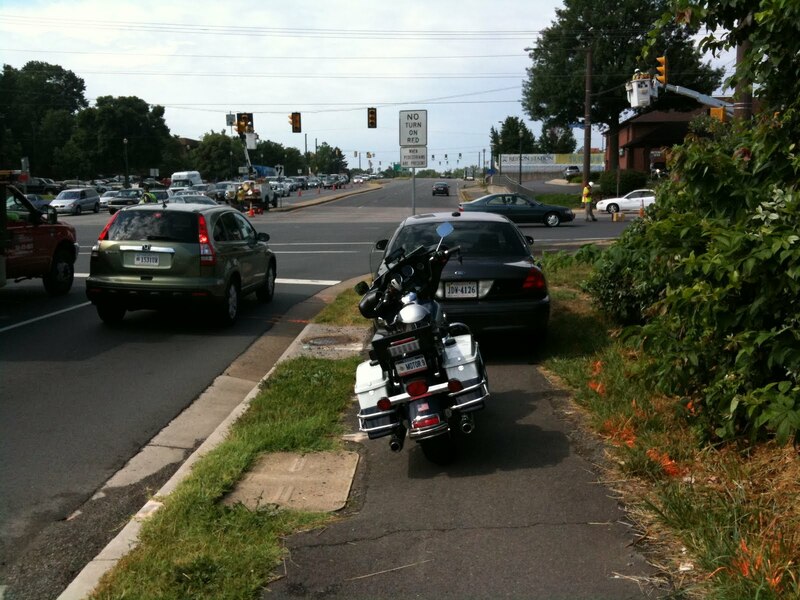 This is a busy intersection and one of the highest ped/bike crash locations in the county. The Wiehle Ave Metro station is under construction a block away. If we think bicycling and walking are legitimate modes, then we should treat them with the same respect we give other modes. Today is Bloomsday, the day that events described in the novel Ulysses by James Joyce occur. "The day involves a range of cultural activities including Ulysses readings and dramatisations, pub crawls and general merriment... Enthusiasts often dress in Edwardian costume to celebrate Bloomsday, and retrace Bloom's route around Dublin via landmarks such as Davy Byrne's pub." FABB's Fionnuala Quinn was asked to help put together a unique celebration of the event, a "leisurely bicycle ride followed by breakfast at the Irish Embassy." As you can see from the photo at the right, the bicycle attire was rather unique. It was a nice touch that they used Capital Bikeshare bikes. For photos from the ride see Megabeth's photostream. 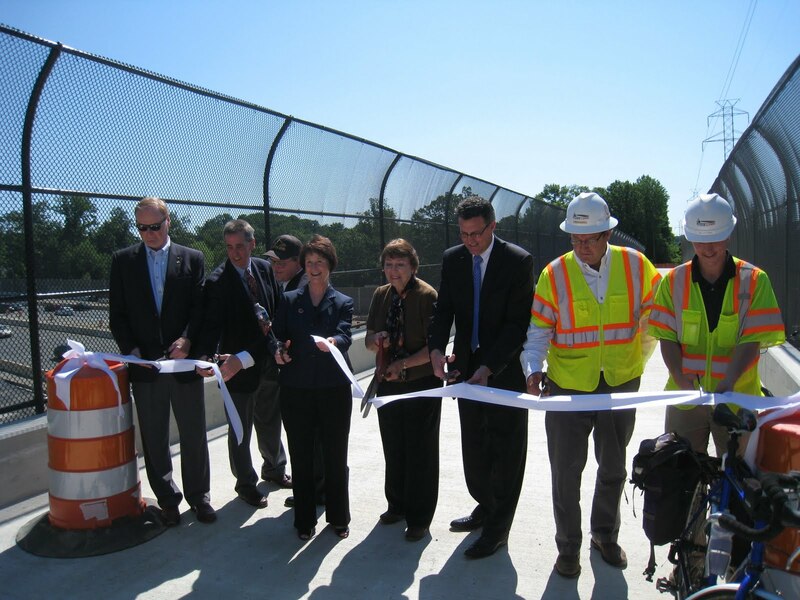 Yesterday the new W&OD Trail bridge over the Beltway that was built as part of the HOT lanes project was officially opened. 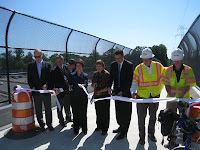 There was a brief ribbon-cutting ceremony on the bridge and later in the day trail traffic was diverted from the old bridge onto the new one. The final layer of asphalt hasn't been applied and the the retaining fence on the north side hasn't been installed. Since this bridge was built next to the old bridge, the trail alignment has changed. Cyclists must now make turns entering and exiting the bridge. It would have been much better for cyclists had the trail been realigned enough to reduce the angle of these turns. We rode across the bridge later in the day to see what it felt like to ride through the turns at speed. We were traveling about 15-17 mph and didn't have to slow when entering or exiting the bridge. To see what it looks like we took a short video clip. Karin Vartowski never owned a car. She rode her bike everywhere. Literally, everywhere. She rode in rain, sleet, snow and Washington's oppressive summer heat. Most days, she meandered along the Capital Crescent Trail or Brookville Road, running her errands along the way. Often she would hold up traffic when she would impulsively stop to pick fresh flowers from a patch on the side of the road. "You feel so much more alive when you are outside in all kinds of weather. Your body stays in tune with what’s out there," she once said. "Bicycling is always an ad­ven­ture and a mystery." Most cyclists have had negative experiences with motorists who behave badly. I've had cans thrown at me, been honked at aggressively for riding in the road (regularly), been yelled at (regularly), but have never been intentionally hit. A Girl and Her Bike was hit from behind by someone who thought it would be fun to harass an innocent cyclist. She was actually hit twice. It turns our that "A Girl" is written by a DC police officer. She was going to ignore the first bump from behind "I ignored this. Why? 98% of the time, it is not worth it to engage with an aggressive driver. At best, you end up getting angrier, at worst, you get hurt. Plus, I spend the majority of my day dealing with people like this and by the time I'm done with work I Just. Don't. Want. To. Anymore." I want to pack the courtroom with cyclists. As the victim of a crime, I am able to present a "Victim Impact Statement" to the judge. You better believe that I intend to bring up the fact that I am a cyclist first and foremost, and that this whole saga began when a driver decided to literally push around a cyclist with his motor vehicle. It was just a matter of luck that this cyclist also happens to be a police officer as well. It is Not Okay for drivers to bully cyclists on our streets. His actions were not only irresponsible, but CRIMINAL. He didn't "accidentally" hit me--he made a conscious decision to hit a human being with a 2-ton vehicle. That is assault. These sorts of things have to STOP. As the date nears we'll post more info here or you can check A Girl and Her Bike for details. We've been writing articles for the Reston Patch about various bicycling topics. The latest is entitled Why Not Bike to the Farmers Market? We live about 5 miles from the Reston Farmers Market at Lake Anne. Most people who visit the market live nearby, and yet most of them drive. Car parking is always a problem and it's so much easier to get there by bike. Most of what we buy can fit into panniers or a backpack. Bike parking isn't the greatest but we're hoping for better accommodations in the future. Maybe we should hold a Bike to Market Day. Last Fall when we were giving away free bike lights on the W&OD Trail near Route 7 we met an intrepid bike commuter. 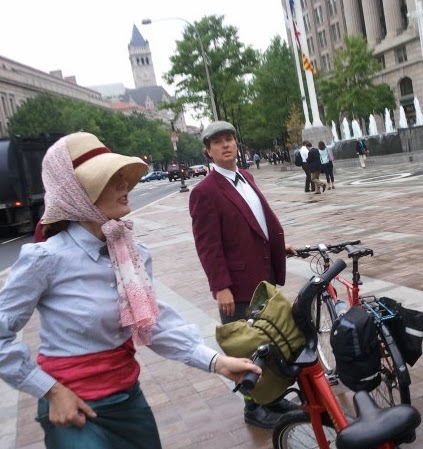 Michele regularly bikes from her home in Dupont Circle to her job at PwC in Tysons. That's a 14.2 mile commute each way. It was a rainy, cool night when we met her but she was undeterred by the conditions. Even though she had plenty of lights she stopped and chatted with us for a while. In our discussion we learned that there are several bike commuters at PwC and the company has a program for encouraging more people to go by bike. The highlight of the evening will be a showcase of WABA's first-ever BikeBuild Contest. Three regional bike shops are going head to head to create custom bicycles with only 3 rules - builders can't spend over $250, may use recycled parts, and MUST be as creative as possible! This year's participants include Oasis Bike Works, City Bikes and Papillon Cycles. Guests will crown BikeFest's Best Builder of 2011 with a combination of their votes and a live auction, which means three lucky attendees will take home their very own handcrafted bikes. There's lot's more planned for the evening, with "carnival-cycle games, a silent auction and raffle, sideshow performances, live music and dancing featuring DC's Second String Band and WABA's very own DJ Jennder, as well as bicycle art by Cranky Style, palm readings, photobooth and much more!" Why not support WABA and have some fun at Bikefest? The purpose of the study is to identify transportation needs within the I-66 corridor and to evaluate the impact of proposed improvements to meet those needs. In accordance with the National Environmental Policy Act (NEPA), a Tier 1 Environmental Impact Statement (EIS) is being prepared with the Federal Highway Administration (FHWA). The study is scheduled for completion in late 2012. Fairfax Advocates for Better Bicycling have the following comments on the STUDY FOR INTERSTATE 66 OUTSIDE BELTWAY. We feel strongly that the scope of this study should adequately consider the needs of bicyclists and pedestrians who want to travel along and across this 25-mile corridor. I-66 outside the Beltway should have a parallel bikeway, similar to the Custis Trail along I-66 in Arlington. Fairfax County has indicated the need for this trail by including it on the county comprehensive plan in the form of the Countywide Trails Plan, approved by the Fairfax County Board of Supervisors in 2002. 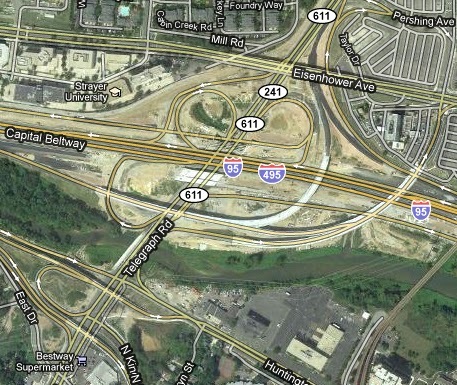 The Plan indicates a Major Regional Trail along I-66 outside the Beltway in Fairfax County (http://www.fairfaxcounty.gov/dpz/comprehensiveplan/maps/trailsplanmap.pdf). In addition, low-traffic bicycle and pedestrian crossings of I-66 should be provided at frequent (1-mile or less) intervals. Due to construction of HOT lanes on the Beltway, all bridges over the Beltway are being rebuilt. Most are complete, many with new bike facilities. The new W&OD Trail bridge has been under construction for many months. It is scheduled to open on June 15 at 10am with a ribbon-cutting ceremony at the new bridge. 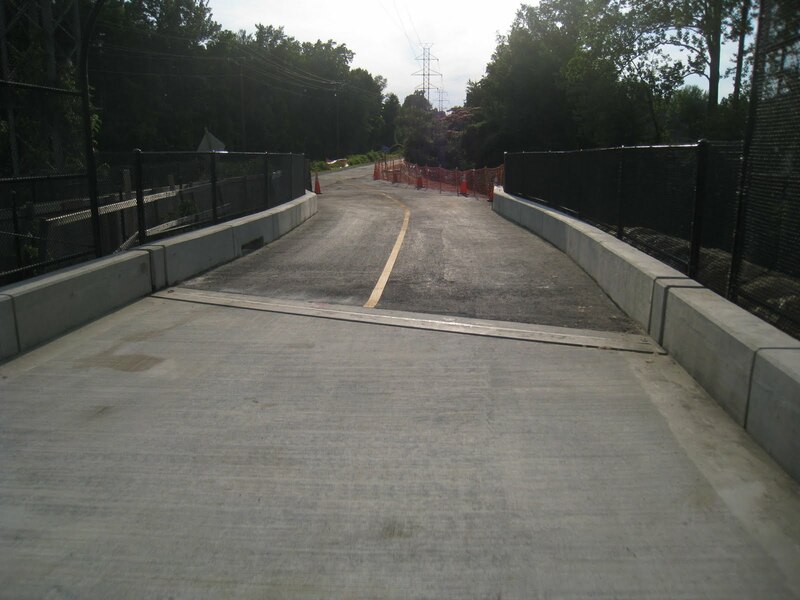 Since the new bridge is offset from the existing trail, cyclists will have two sharp turns to make to use it. We're hoping the angle isn't too sharp that fast-moving cyclists won't have problems staying in their lane. We'll have a chance to check it out on June 15 as we plan to attend the ceremony. Kilmer Middle School is located just south of Tysons Corner off Gallows Road. Many kids bike to the school, especially after a short bridge was constructed that links two sections of Wolftrap Road. As we mentioned in an earlier post, bike parking at the school was not sufficient for holding all the bikes. They were parked against benches, the flag pole, etc. 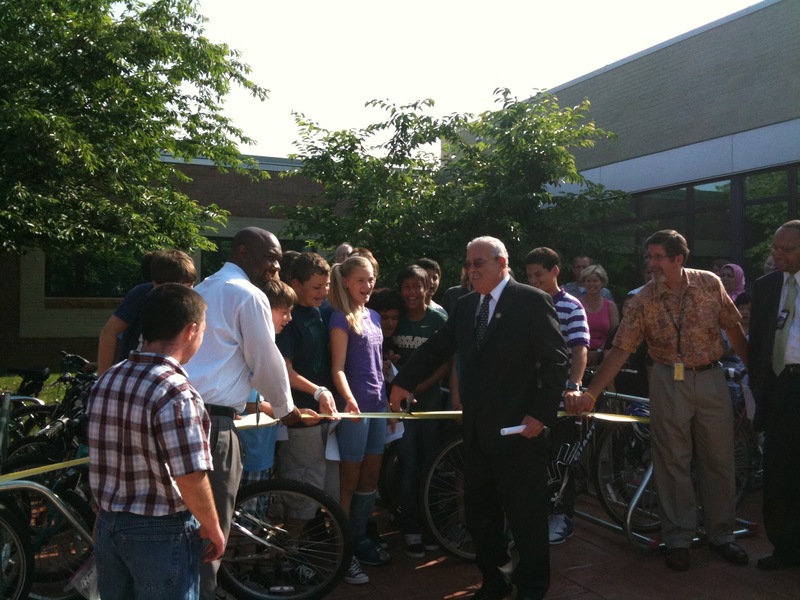 Today the school held a ribbon-cutting ceremony to celebrate the installation of two new bike racks. The racks sit on a very nice concrete/stone pad. Congressman Connolly was present and talked about the need to provide alternatives like bicycling to ease our congestion and pollution problems, especially for short trips like trips to school. Congratulations to Kilmer and especially to Assistant Principal Larry Knighten who made it happen. We would have preferred that inverted U racks were used instead of the grill racks, mainly because any bikes that have fenders or panniers don't fit into the grill slots, and it's almost impossible to use a U lock. These issues aren't a great concern with most kids bikes, so the grill racks should be OK.
See the Vienna Patch article New Bike Racks At Kilmer Draw Visit From Connolly. As a non-profit, WABA relies largely on community support for its funding. 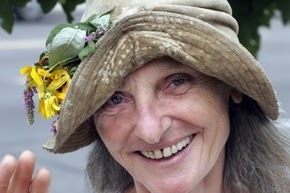 The fundraising event for 2011 follows a new model. 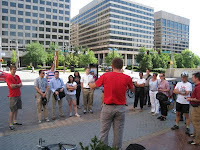 With plenty of opportunities bike-related fun, games, and music, we are holding our BikeFest Celebration and Fundraiser on June 11, 2011 in Crystal City. As usual, car-free transportation to and from the event is encouraged, including transit, group rides, and combinations of bike-on-metro and trail riding. For more information,to purchase your tickets, or simply to contribute to WABA visit the BikeFest page. A new pedestrian bridge will officially open at Lake Fairfax Park on Saturday, June 4, 2011 marking the completion of a much-anticipated trail improvement, and more importantly the conclusion of a successful partnership between neighbors, trail friends, public sector peers and private sector supporters. The public is invited to join in brief ribbon ceremonies at 9:30 a.m., followed by a tour of nearby stream bank restoration projects and sustainable trail development. The event takes place on National Trails Day. The project included the restoration of 232 feet of stream bank on parkland and the installation of a 40 by 6 foot wide pedestrian bridge over Colvin Run in Lake Fairfax Park in Reston, VA. Northern Virginia Stream Restoration (NVSR) L.C. was contracted to provide improvements to several streams on Reston Association common properties. A portion of those properties included Fairfax County Park Authority (FCPA) owned land. NVSR offered to complete this work and to also install a missing pedestrian bridge, including all design, permitting, construction and maintenance, in exchange for the right to sell the mitigation credits resulting from these improvements. FCPA evaluated this offer, negotiated an agreement and the work was completed, resulting in a project worth more than $350,000 at no cost to the taxpayers of Fairfax County. A second project in the park utilized bond dollars and supplemental volunteer labor to create sustainable trails, to place pedestrian bridges and to reclaim and improve erosion-prone trails. The $114,000 project selected trail sections based on the Lake Fairfax Trails plan which was created by the International Mountain Biking Association (IMBA) in collaboration with Park Authority staff. Phase I is a section of single-track trail was installed to improve the park’s internal circulation system and to provide trail options for hikers and mountain bikers. Trail improvements were made at several locations and a severely degraded section of trail was rerouted and the original trail restored to its natural condition. Volunteers from the Mid-Atlantic Off Road Enthusiasts (MORE) contributed many hours of volunteer labor. Phase II of this plan will be started this spring. These projects represent partnerships between the Fairfax County Park Authority Board, the Fairfax County Board of Supervisors, the Reston Association Board, Reston Parks and Recreation, MORE and IMBA. The ceremony will be held adjacent to the new bridge. Participants should meet at the north end of the upper campground, following the park road up to the soccer fields. Then follow the signs just a short distance through the woods to the new bridge. Lake Fairfax Park is located at 1400 Lake Fairfax Drive. For more information contact the Public Information Office at 703-324-8662. The annual Tour de Cure rides will be held on Sunday starting at the Reston Town Center. Sponsored by the American Diabetes Association, there are several ride options: 12, 17, 20, 33, 63, and 100 miles. "Each ride is fully supported with route marshals, SAG vehicles, mechanical support, and rest stops to fuel your journey. Morning check-in on June 5th is still an option and our volunteers are happy to assist you. Route cue sheets will be provided. 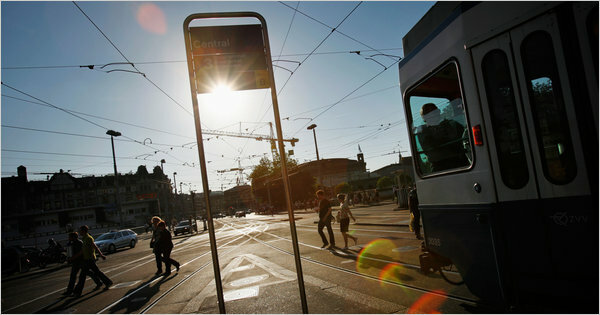 Please arrive at the time that corresponds with your route." See the Reston Tour de Cure site for details.